I read the longtime activist's memoir looking for pointers, lessons and examples for how to sustain a lifetime of activism — and boy, did I find it. Vitality, verve and vision. Those are three words that come to mind when I think of Frances Crowe, the peace powerhouse of Western Massachusetts. 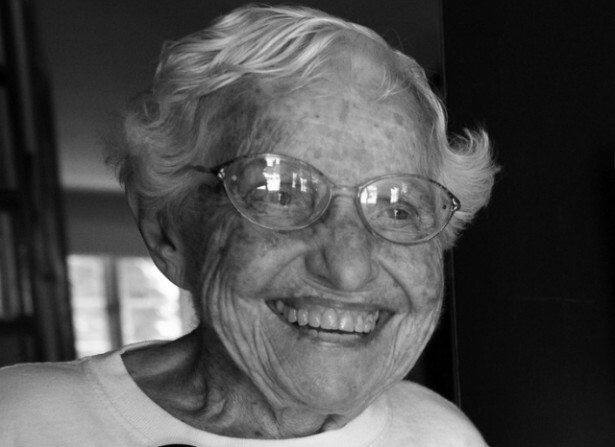 Frances will celebrate her 96th birthday on the Ides of March. She was already old when I met her more than 20 years ago as a student at Hampshire College. As a work study student, I cleaned toilets on the second floor of the library for a year before realizing that I could intern for the American Friends Service Committee, or AFSC, in Northampton instead. In a peace-poster-plastered office, in the basement of her tidy home up the hill from NoHo’s main drag, I learned how to file papers, make copies, call reporters, draft press releases and take phone messages. Sometimes she would send me out with a roll of tape and a staple gun to hang posters for events on telephone poles and coffee shop bulletin boards. I don’t recall what big issues we were organizing around at the time. There was U.S. military intervention in the former Yugoslavia, the imposition of neoliberal economic policies in Central and South America, the 50th anniversary of the bombing of Hiroshima and Nagasaki to name a few of the mid-90s issues that her AFSC office would have been concerned about. Sometimes we would eat lunch together: Homemade hummus and cut up vegetables, cottage cheese with nutritional yeast, thick slices of whole wheat bread. In the book, she recounts her upbringing, education and as much of her family background as she was able to uncover. This is all interesting stuff, but the book really gets going when she begins to relate how her adult life intersects with history. Frances married Tom Crowe in May 1945 and they moved to New Orleans where Tom served as a doctor on an Army ship. On August 6 of that year, she was ironing placemats and making arrangements to welcome her husband home after a tour of duty. She listened to the radio as she worked to make a picture perfect home and meal for his return. The announcer said that the United States had dropped a new kind of bomb on the Japanese city of Hiroshima. “This act of violence shook me to the core,” Frances writes. She unplugged the iron and went out into the streets, looking, she writes, “for someone interested in nonviolence.” New to the city, she could not find a peace center, but she walked into a used bookstore where the shop keeper told her to start with Leo Tolstoy, “the father of nonviolence.” And so she did. Years later, Frances learned that this is exactly where Gandhi started too. Of course, Frances Crowe was a mother and grandmother when I met her as a college student. But, the pride and effort of parenthood isn’t something normally shared between young adults and elders. So, one of the great joys of “Finding My Radical Soul” is learning about how Frances lived life as a mother. Before she was an organizer or an activist, she made things happen for her kids. In fact, more than any book or mentor, she learned how to be an advocate for peace and social justice by being an advocate for her kids — by listening to them, responding to their needs, ensuring their safety, security and freedom to explore and grow into their own people. Long before there was a body of scholarship and mountains of resources about educating deaf youngsters — about mainstreaming versus inclusion versus deaf culture and American Sign Language — Frances worked with her oldest son Jarlath, who was born deaf, to figure out the best place for him to learn and connect. She understood him as “a 10 acre child,” who needed space and activity, and she advocated for him. “Much of my early married life involved pursuing education for my children,” she writes, before going on to describe her effort to find the right educational fit for each of her children, by educating herself and her husband, and reaching out for what her kids needed. 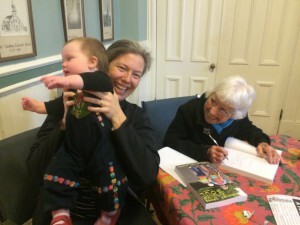 Her son Tom ended up at the East Hill Farm School — a hands-on educational environment — where he worked and studied alongside the grandkids of Catholic Worker co-founder Dorothy Day and Russian novelist Alexander Solzhenitsyn. Frances Crowe writes simply about the watershed moments in her life. 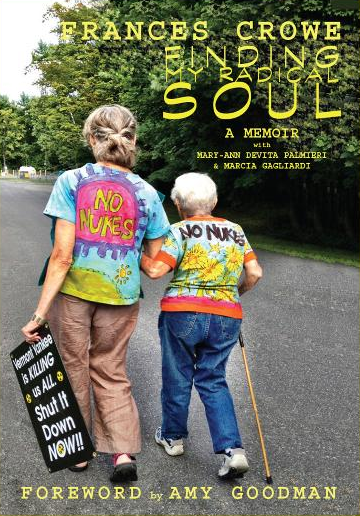 Through her husband Tom’s work on radiation, she learned of the dangers of Strontium 90, which showed up in cow’s milk after the United States began above-ground nuclear weapons testing. She bought powered milk manufactured before nuclear testing and thus free of the poisons. But her kids hated powered milk and no matter how she tried to dress is up with sugar or flavoring, they would not drink it. When the Vietnam War began, Frances visited draft counseling offices to see how she could help, but she saw counselors encouraging young men to lie or cheat their way out of the draft. Counselors advised them to pretend to be mentally unstable, drug addicts, or intent on self-harm. Frances did not like that. “I wanted to help them use the very best from within themselves” to resist the draft, she writes. She took out an ad in the local paper inviting people to her house for draft counseling, but no one came. So, she spent the day picking up hitchhikers and asking them “What are you going to do about the draft?” Armed with a mimeographed page of information and directions to her house, she writes that “I drove slow and talked fast.” By the end of the day, she had reached enough young men to establish her draft counseling office. She writes that from 1968 to 1969 — when she kept a weekly tally — there were 1,776 separate office visits (some men came back many times as Frances helped them with their conscientious objector claims). Her husband was supportive of this work, but if the young men stayed past 10 p.m. on Friday nights, he would begin pacing to try and move them along. Throughout the book, Frances’ love and admiration for Tom shines through. “He always said he was trying to understand the world and I was trying to change it,” she writes. People would jokingly call him “Mister Frances Crowe” because he was quiet and reserved, but Frances insists “he was living his life and I was living mine in a good and loving marriage — that is the most important thing in my life.” Tom died in May 1997. A few years ago, her grandson Tomas started a mini “Don’t Drive For Frances” campaign for her birthday (best present ever). Now, with her 96th right around the corner, join me in Walking With Frances on the Ides of March (and buy her book).